Indiana will look to snap a three-game losing streak as it travels to West Lafayette on Saturday afternoon to take on Purdue. The Boilermakers are 11-6 overall and 4-2 in Big Ten play. Indiana’s 3-0 Big Ten start is now a distant memory. The Hoosiers haven’t won a game since Jan. 3 and their three Big Ten wins are over teams with a combined conference record of 2-17. And the road doesn’t get any easier from here. Indiana’s next challenge comes at Purdue, which is 5-1 since losing to Notre Dame in the Crossroads Classic last month in Indianapolis. The Boilermakers looked like a fringe NCAA tournament after that loss, but have turned things around thanks to strong play from Carsen Edwards and the emergence of Trevion Williams. This is a game that the Mackey Arena faithful circle on the calendar each year and IU is likely to encounter the loudest road atmosphere it will face all season. Edwards is a legitimate All-America candidate and the primary reason the Boilermakers have been able to withstand the graduation of four starters from last season’s team that finished 30-7. The 6-foot-1 junior is averaging 24.9 points per game on 42.8 percent shooting from the field. In Big Ten play, he’s using 33.9 percent of Purdue’s possessions while on the floor, which is the second highest usage rate in the league behind Wisconsin’s Ethan Happ. Edwards is great as the ball handler in the pick-and-roll and in spot-up situations, according to Synergy. He ranks in the 75th percentile nationally in pick-and-roll (.9 PPP) and in the 84th percentile on spot-ups (1.15). Edwards also does a good job of not forcing the issue if there isn’t a play to be made. His assist rate is 16.9 percent in Big Ten games and he’s a willing passer to guys like Ryan Cline and Grady Eifert, who can knock down the 3-pointer. Cline is a great example of a player developing over four seasons and capitalizing on an increased role as a senior. The Carmel product has one elite skill (shooting) and when he’s open, he lets it fly to a high degree of success. He’s shooting 40.9 percent overall on 3s and 44.7 percent in Big Ten games. The 6-foot-6 guard is second on the team in scoring at 12.6 points per game and the only Boilermaker averaging in double figures outside of Edwards. Purdue’s point guard is Nojel Eastern, a 6-foot-6 sophomore. Eastern isn’t a threat to shoot from the perimeter, but he’s pretty good at using his size to bully smaller defenders. He can be turnover prone at times (20.8 TO%) and is a poor free throw shooter (47.1 percent), but is finishing close to 55 percent of his 2s. Two reserves who could see minutes in the backcourt are redshirt freshman Sasha Stefanovic and freshman Eric Hunter. Stefanovic is a 40.5 percent 3-point shooter. Hunter has struggled as a freshman, but has promise for the long term because he is wired to score. Senior Grady Eifert is Purdue’s starter at the four and he averages 4.8 points and five rebounds in close to 24 minutes per game. The Fort Wayne native doesn’t use many possessions, but when he does shoot, he’s having success. In Big Ten play, he’s 6-for-11 on 2s and 4-for-9 on 3s. A back injury to Evan Boudreaux opened the door for Williams, a freshman, to increase his role. And he’s run with the opportunity. Williams has dropped more than 50 pounds since coming to Purdue and the Michigan native gives the Boilermakers a more traditional big man. Over Purdue’s last three games, Williams is averaging 12.7 points and 12 rebounds per game. Boudreaux’s status is unclear for Saturday, but the Hoosiers will definitely see Matt Haarms off of the Purdue bench. The 7-foot-3 Haarms is an elite shot blocker and energy guy. He’s leading the conference in block percentage and is finishing 60 percent of his 2s in conference games. Freshman Aaron Wheeler sat out last season as a redshirt, but is averaging 4.9 points and 3.4 rebounds in 14.4 minutes off of the bench. Two primary areas of concern for Indiana are Purdue’s offensive rebounding and its ability to force turnovers. The Hoosiers are a poor defensive rebounding team and Purdue is currently grabbing 36 percent of its missed shots in Big Ten play. Indiana is just 12th in defensive rebounding percentage in conference play and if the Hoosiers don’t shore that up soon, it’s going to be tough to beat teams like Purdue and Michigan State, who attack the glass relentlessly. Purdue is also forcing its Big Ten opponents to turn it over on 23.1 percent of its possessions, which leads the league. Indiana has been much better in recent weeks in terms of taking care of the ball, but there’s still work to be done. The Hoosiers are turning it over on close to 18 percent of their possessions in conference play. Also worth noting: Purdue is living off of 3-pointers in Big Ten play. The Boilermakers are first in percentage of points coming from 3s in league games at 40.5. Purdue is shooting 37.3 percent on 3s in Big Ten games. The Vegas line won’t come out until later on Friday, but the Pomeroy line favors Purdue by six and Sagarin likes the Boilermakers by close to 5. There are many reason to like Purdue in this game. First, the Boilermakers are playing very well in recent weeks with easy home wins over Iowa and Rutgers and a road win at Wisconsin. Indiana, meanwhile, has been trending in the opposite direction as its defense has been a problem in losses to Michigan, Maryland and Nebraska. 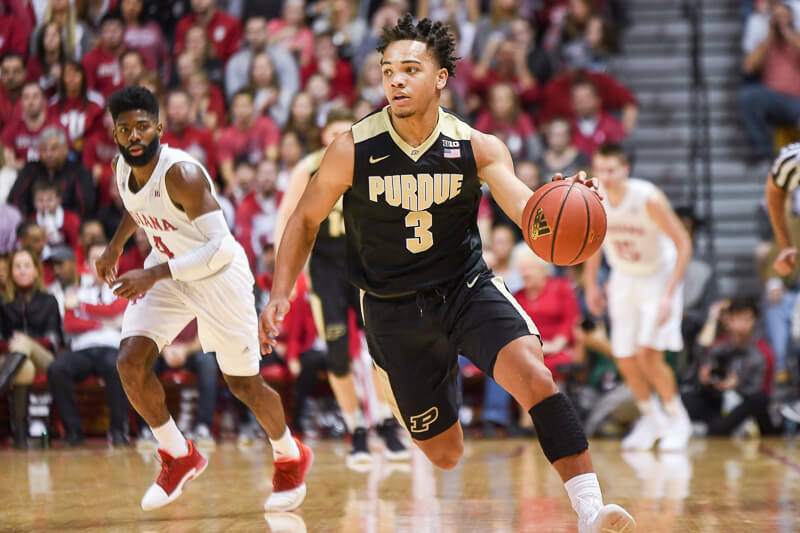 Mackey Arena offers one of the Big Ten’s best home court advantages and while Purdue doesn’t have a great matchup defensively for Juwan Morgan or Romeo Langford, the Hoosiers, like most teams, are unlikely to have a great answer for containing Edwards.